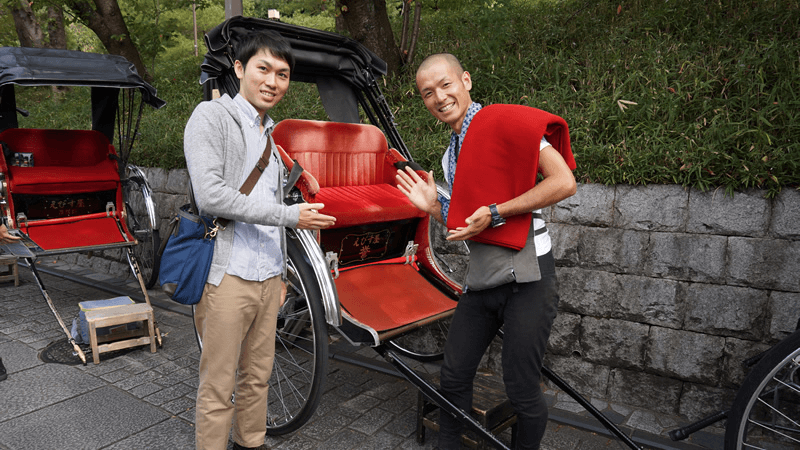 Sharing Kyoto's writers went out and tried riding a rickshaw through Kyoto, seeing all the best spots of Kyoto in a day. Kyoto has many tourist sights all over. Most of us want to see as much as we can. However, time is limited and too much walking is simply exhausting. And so I recommend EBISUYA's Rickshaw! 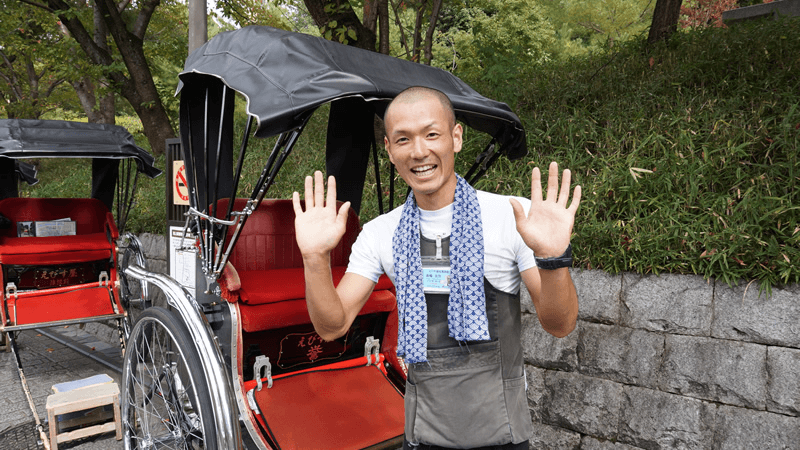 You can tour the sights easily by rickshaw. We decided to tour the Higashiyama area. 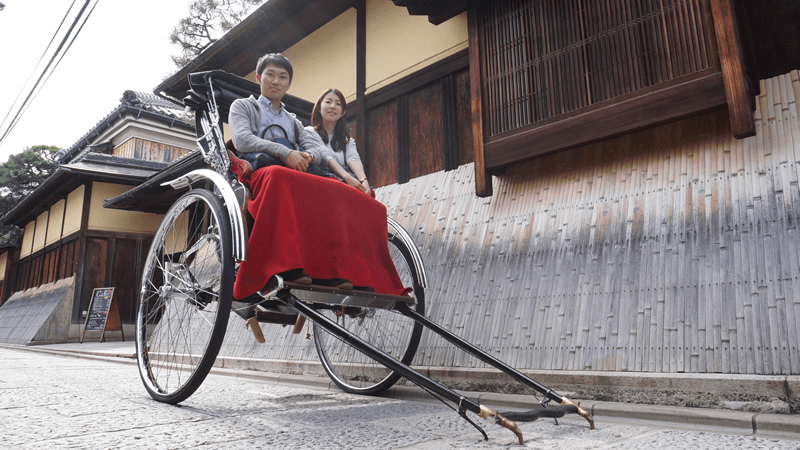 *Rickshaws are also available in the Arashiyama area. The rickshaw driver is really nice and physically strong. Off we go on our tour! We started out from Ichinenzaka Slope, near Kodaiji Temple. 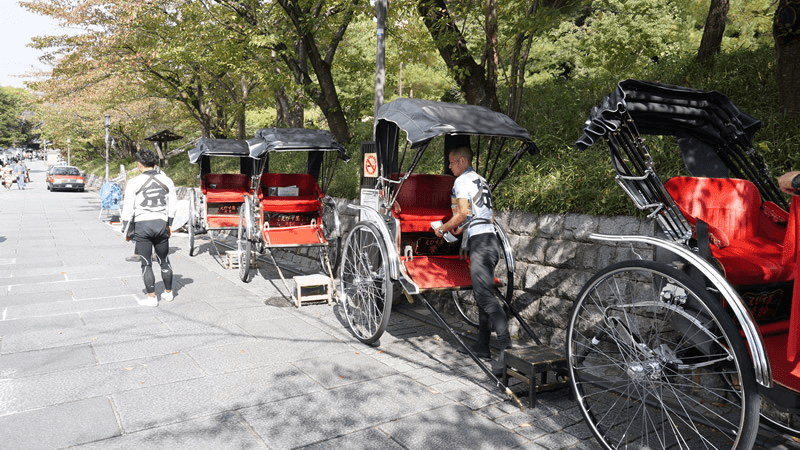 Ichinenzaka Slope has many rickshaws standing by. Tell a driver that you want a rickshaw. First, talk with the driver to decide the duration. The tour cost and route will depend on the tour's duration and number of people. We decided on a 30-minute tour for two of us. The total cost was ¥9,000. The driver was really nice! We got on the rickshaw and found the seat to be very soft and comfortable! The roof provides shade on hot, sunny days. In the colder months, we can get a warm blanket. Our rickshaw trotted along the stone path. Our rickshaw weighed 80 kg! With passengers, it weighs much more. Amazing how strong our driver was! Going through Kyoto's elegant townscape on a rickshaw. The driver is very knowledgeable about the area. While pulling the rickshaw, he explained about the sights. It was interesting to learn about local history and culture. 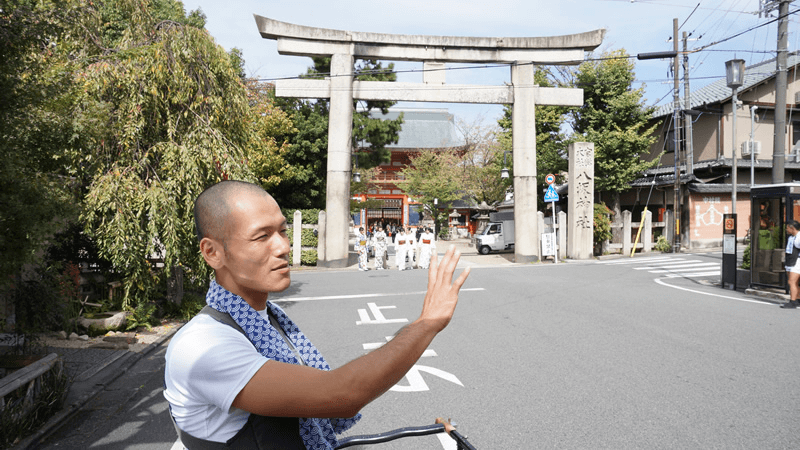 Driver explaining about the famous Yasaka Shrine. While riding on the rickshaw, we could take pictures anytime. The driver also took our pictures here and there. Snapping our picture in front of a nice, traditional house! 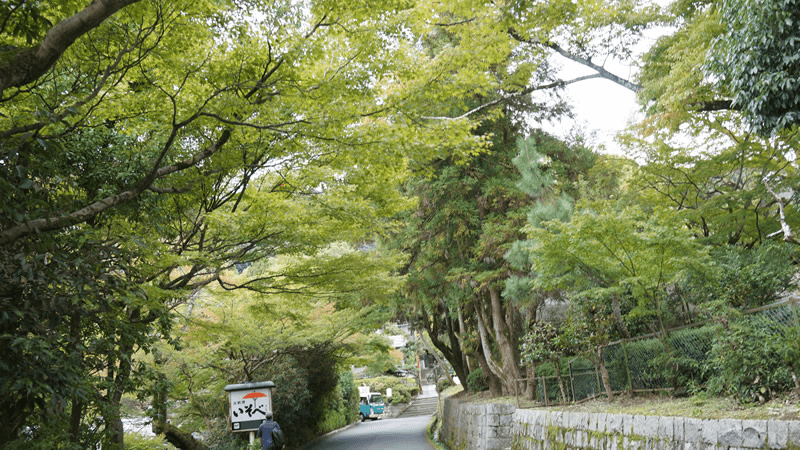 The Higashiyama area also has lots of greenery. Maruyama Park, especially, has many trees, making it a pleasant place. In spring, it has cherry blossoms. And in autumn, you can see fall colors. When we went in mid-October, we enjoyed the beautiful greenery. Enjoy nature in different seasons. We headed back and really enjoyed the tour. The tour ended where we started off. 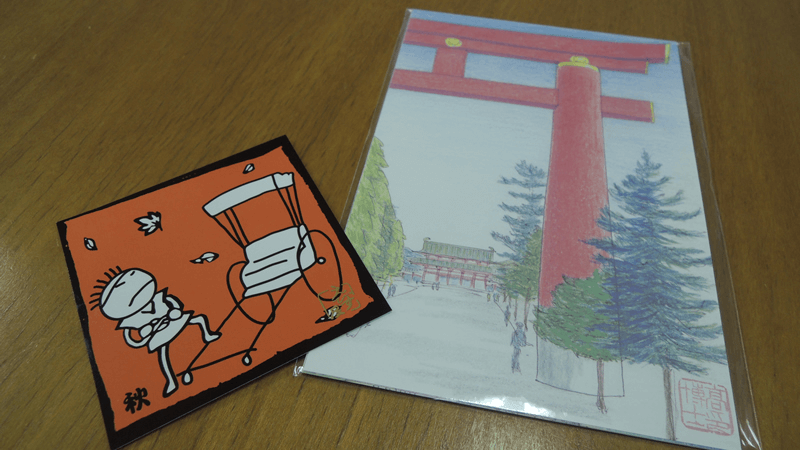 After the tour, we received a sticker and picture postcard! *You get a picture postcard if your rickshaw tour is 30 minutes or longer. There are four types of stickers for the four seasons. We received the autumn one. If you collect all four stickers, you can receive the same T-shirt the driver is wearing. If you can't decide where to go after the rickshaw ride, just ask the driver. He can recommend shops, restaurants, and sights! Notice the driver's muscular back and arms, wow!